Icelandic skyr is trying to make a splash in a market ruled by Greek yogurt. The Vikings are ready to rumble with the the Greeks. The battleground: the dairy aisle. Yogurt is a big business these days and Greek yogurt has got the market cornered. In particular, Chobani is selling like hot cakes. But Iceland has its own yogurt to sell. 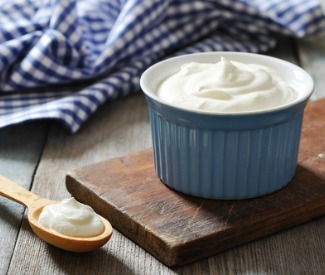 Skyr is very much like Greek yogurt, but thicker with a more “yogurt-y” taste. (Clearly, I’m not a food writer.) Both are delicious. But Siggi’s, a popular brand of skyr (maybe the popular brand of skyr), maintains that the competition is packed with sugar. This is the big selling point and primary message for Siggi’s: Skyr has “natural ingredients and less sugar.” Since most people are eating yogurt to be healthy, Siggi’s thinks the choice is obvious. Technically, The Atlantic points out, there is no difference in the sugar content in the plain flavor of either brand. But when you’re talking about healthy food, these sorts of messages can make a big difference. “[T]his suggests that sugar is the new fat, when it comes to scary food advertising,” the magazine writes. And, the article continues, Chobani is facing a lawsuit about the high sugar content in its products (as much as a “fudge bar“). So Siggi’s could be saying something that resonates. However, people like sugar even when they’re reluctant to admit it. And they like to think that they’re being healthy, even when they’re dousing their healthy portion with a dose of sweetness and fat. As a kid, I can remember yogurt being a food one only ate when they were on a diet. These days, people eat it daily for nutritional reasons as well as taste. Now that customers have become connoisseurs, you’ll find more people willing to taste and try new flavors. The key is to keep them coming back. The Atlantic writer notes the “tangy sourness” of Siggi’s, which she’s accustomed to from a childhood eating Russian tvorog. We’ll have to see whether this will please American taste buds. And then there’s price. Siggi’s is more expensive. But for “better” foods, people will pay. Is Siggi’s “better?” The marketing says so.